thee as a witness, as a bearer of glad tidings, and as a warner, as one who calls unto God by His Leave, and as a luminous lamp. disregard their affront, and trust in God. God suffices as a Guardian. Commentary: Throughout the Islamic world sacred musical gatherings usually begin and end with the recitation of the Qur’an. This is done in acknowledgement that all things have their beginning and end in Allah. The style of recitation heard here is unique to the Ḥijaz region of Saudi Arabia. This particular form of recitation is also known as Ḥafs and is traced back to the Prophet (pbuh). For Ali, Husayn and Hasan. Commentary: This is a beautiful love song in praise of the blessed family of the Prophet (Ahl al-Bayt). The four principle rivers of paradise (water, date wine, honey, and milk) go back to Prophetic descriptions of paradise. The poem is inspired by these early traditions. It is of unknown provenance, though it may originate from Morocco or Andalusia. The earliest known reference to this piece dates back to the 17th century, though it may have been composed earlier. Although this piece is traditionally performed a cappella and without harmony, it has been rearranged and modified with minor vocal harmonies for this recording. *In Islamic orthodoxy, love alone is not sufficient to gain entry into paradise. This verse is a pious, poetic hyperbole that is not to be taken literally. With blessings that abide like the sky’s lofty ceiling. Upon the day when all need an intercessor. For in our day our power has grown faint and feeble. Thus did you once foretell, the decent in danger. For on this day we tire, after blunder and quarrel. Commentary: The lyrics of this song come from portions of the thousand-verse Hamziyya (poem rhyming in hamza) of the renowned Palestinian scholar Yusuf Nabahani (d. 1932). It describes the Prophet’s life and character and is frequently recited during Mawlid celebrations to commemorate the Prophet’s (pbuh) birthday. The melody sung here is inspired by group chants of the Shadhili-Darqawi-‘Alawi Sufi Order in Mostaghanem, Algeria. The melody has been slightly modified to fit the English lyrics (which are a translation of the original Arabic). English lyrics and translation provided by Dr. Tim Winter. O Prophet of God, O Intercessor! Commentary: This beautiful song comes from the Kurdish Qadiri zawiyas (Sufi centers) of Western Iran. It is a traditional devotional piece expressing love of the Prophet and longing to visit Medina. The original words are in Kurdish but additional verses in Persian, Turkish and Arabic have been added. The traditional khānghāh daf rhythm of “Ḥay Allah, Ḥay Allah” is incorporated into this piece with a time signature of 10/8. *This section (till the Kurdish refrain) is an entirely new composition added by Sami Yusuf with words by Payam Azizi. Turkish words by Dr. Savaş Barkçin and additional Kurdish words by Payam Azizi. Send salutations upon him with the sweetest of words! My messenger, the best of mankind! Commentary: This is the second part of “Ya Rasul Allah”. We split the song over two tracks for easier listening. *This is a new section (till the refrain) composed by Sami Yusuf with words provided by Dr. Imed Nsiri. A humble slave am I of an almighty Lord. No work is too hard for that One who’s adored. To claim any strength, sure and strong is my Lord. just “Be”, and it is, by the might of a King. All blessings and grace by the might of a King. I’m but a humble slave, what should I worry about? Why feel such remorse when the Maker provides? And no strength have I — His all power and might. All gratitude and praise are His due and His right. Commentary: Written by the Moroccan poet Sidi Othman ibn Yahya Cherki (known as “Sidi Bahloul Cherki”) in the 17th century, the qaṣidah (ode) “Fiyyashiyya” became a standard classic of the Maghrebi genre of malhoun— a genre of Sufi music popular amongst tradesmen in the urban centers of what is today Morocco, Algeria, and Tunisia. Sidi Bahloul was a member of the Harraqi zawiya of Tetouan in northern Morocco, and his poetry, especially this qaṣidah, continues to be chanted by the members of his Shadhili-Darqawi-Harraqi Tariqah to this day. It has become one of the best-known and loved traditional songs amongst Moroccans from all walks of life. The inclusion of tanbour and daf gives this new arrangement a Persian or Khorasani touch. We have also added English lyrics to the song (English lyrics and translation provided by Dr. Tim Winter). Commentary: This song, written in honor of the great Indian saint and founder of the Chishti order, Mu‘in ad-Din Chishti (d. 1236), was composed by the Sabri brothers from a compilation of poems and melodies of the Chishti order. The music and lyrics have been modified in this rendition: the words are sung entirely in Arabic about the love for the blessed Prophet (pbuh), his household and companions. Come, see, what love has done to me. One day like the floods I’m flowing. No more tears, for laughs I’m praying. Waking up again in sadness. Head to toe I hurt and sicken. Commentary: “Ben Yürürüm Yane Yane” is a Sufi song that is popular throughout Turkey and the Balkans. The poem was written by the poet and Sufi mystic, Yunus Emre, who lived in central Anatolia in the 13th century, and it has been sung in the ceremonies of many different Sufi orders in Turkish-speaking lands for hundreds of years. Yunus Emre’s poetry conveys the human longing and love for the Divine, and it continues to be a source of inspiration for composers of Sufi music today. This English rendition, a direct translation of the original Turkish, has been slightly modified from the original melody (introductory music composition and arrangement only) and is sung partially in the original Turkish. English lyrics and translation provided by Dr. Tim Winter. I sealed up my heart against Thy enemy. My heart’s inner secrets, but Thou I don’t see. The first’s for Thy love, and the other’s for Thee. Remembrance complete, not distracted from Thee. I see Thou as present in all that I see. For Thine is the glory in all unity. Commentary: This most famous poem of the 8th century female Sufi saint of Iraq, Rabi‘a al-‘Adawiyyah, has been set to music many times, but this Andalusian melody fits the tone and rhythm of the poem beautifully. The inclusion of the tanbour and daf add a Persian influence to the piece. English lyrics and translation provided by Dr. Tim Winter. O the Ever-Living, The Ever-Lasting One! Commentary: Although the exact origins of this qawwali are unknown, it is sometimes sung to revere the 12th century Sufi saint, Fariduddin Masud Ganjshakar (or Baba Farid) of the Indian subcontinent. A direct descendant of the second caliph of Islam, ‘Umar ibn Khattab, his poetry is also included in the Guru Granth Sahib — the most sacred scripture of Sikhism. Not only are the verses of this qawwali based on his teachings, but the opening verse of the qawwali, “Ya Hayyu Ya Qayyum” were the last words Baba Farid uttered. It is related that on the 5th of Muharram, in the year 1266 (according to the Gregorian calendar), Baba Farid became unconscious after the ‘Isha (evening) prayer. When he regained his consciousness, he inquired of those present, “Have I offered my ‘Isha prayer?” Although those present answered in the affirmative, Baba Farid replied, “Let me offer it once more for I may not get another chance.” So, he performed ablution again and offered the ‘Isha prayer a second time. Then he fell unconscious once again. On regaining consciousness, he once more performed his ablution and said the ‘Isha prayer for a third time. Whilst still in prostration, he uttered, “Ya Hayyu Ya Qayyum”, and his soul left his body. That is why, for hundreds of years, this qawwali has been sung at the death anniversary of Baba Farid. *In the original version, the word used here was “Dayyān” but this has been replaced to “Mannān” (The Bestower). Commentary: “Ṣalla l-Lāhu ‘alā Ṭāhā” was written by the Sudanese/Egyptian Shaykh Salih al-Ja’fari (d. 1979) who taught and lived at the famous al-Azhar University in Cairo and was also the Imam of the al-Azhar mosque. He was a Sufi shaykh in the lineage of Ahmad ibn Idris of Fez (d. 1837) and a prolific author of works on the Qur’an, Hadith, Islamic law and Sufism. He also wrote a celebrated collection of poetry, from which this song is taken. The end section incorporates the blessed names of the Prophet (pbuh) taken from the Diwan of the famous Moroccan Sufi saint Imam Mohammed Al-Jazuli’s (d. 1465), Dala’il al-Khayrat. *The Sidra is a reference to the “Lote tree of the furthest boundary” (sidrat al-muntahā) mentioned in the Qur’an (53:14) and described by the Prophet on his night journey to heaven (mi’rāj). The sidra marks the outer boundaries that separate the created world (‘ālam al-khalq) from the spiritual world of the divine command (‘ālam al-amr). **This section is an original composition with words provided by Mohammed Ali El Oumari and Abdel Ilah Ikhal. The inspiration behind the melody comes from an old Kurdish folk song heard by Sami Yusuf when he was a child. The chains of His curls have captured us and the yearning of our hearts have captured Him. The fiery wine has come, demon of grief, off to a corner! Leave O death-pondering soul, O immortal Saqi, come through! Our being is by your being, a thousand hails! From your sound, comes the fragrance of fidelity day and night! Begin once more and tune those notes! Commentary: This beautiful piece comes from the Khanqahs (Sufi centers) of the Qadiriya-Talebani Tariqah in Kirkuk, Iraq. The original poem (“Mosalmanan”) was written in Persian approximately 200 years ago by Shaykh Abdul Rahman Khales (Shaykh of the Qadiriya-Talebani Sufi order). However, the lyrics of this rendition come from Mawlana Jalal ad-Din Balkhi’s (“Rumi”) Divān-i Kabir (Ghazal 34). The daf “Ḥay Allah” maqām is used in the first half of this piece followed by Maqām Haddādī (both traditional khanghāh rhythms). *God’s name, “al-Ḥayy” (“The Living”), is often chanted by Sufis in spiritual sessions because it permeates all life and attracts the blessings of God who is the source of all life. The name “Ḥayy” is also the beginning of each breath we take. Without “al-Ḥayy”, all would perish. The name Allāh is the all-comprehensive name of God that contains within it all the meanings and significance of all the other Divine Names. The “Hu” is derived from “Huwa” (He) and expresses the divine Essence (al-dhāt al-ilāhiyya) which can neither be grasped nor encompassed by anything other than Itself. Commentary: This piece, the only original composition on the album, takes as its structure the traditional maqām and dastgāh musical systems. Within this framework, the music evokes both power in its dynamic rhythms and beauty in its interwoven melodies. An echo of the Sufi samā’, the ceremony of listening and remembrance, can be heard in the resonant “Allah Hu”. Whatsoever is in the heavens and the earth glorifies God, and He is the Mighty, the Wise. He is the First, and the Last, and the Outward, and the Inward; and He is Knower of all things. Commentary: This style of recitation is typical of the ‘old Egyptian’ style. Quranic recitation at the beginning and end of a sacred musical event is an acknowledgement that all things have their beginning and end in Allah. This particular form of recitation is known as Ḥafs and is traced back to the Prophet (pbuh). What is music and why is there so much of the enchantment of love in it? Music is the secret of love and love is the secret of God. We heard these songs in paradise. Those whose hearts still long for that time out of time will find much to appreciate in this album. 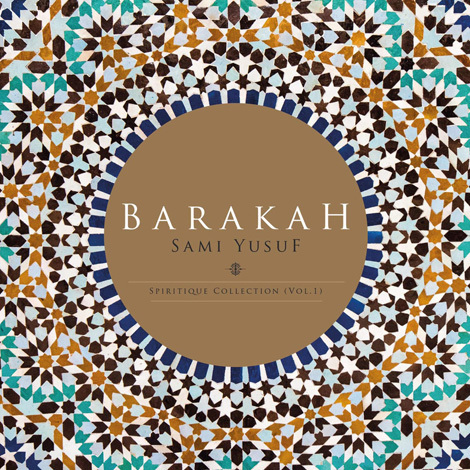 In a world that is increasingly noisy and chaotic, the music and lyrics of this album—drawn from centuries of Sufi traditions—offer a window onto an inner oasis of peace and harmony. What makes traditional Islamic music truly Islamic is not merely the lyrics or the faith of the performer, but rather the presence of the same Divine grace that emanates from the Qur’an and the person of the Prophet—the barakah muhammadiyah. This barakah can be seen in the great masterpieces of Islamic architecture and calligraphy and heard in the arresting beauty of the adhaan (call to prayer), in the beautiful recitation of the Qur’an, and in the various traditions of sacred music represented here.